Before doing this exercise you must first have Delphi installed on your PC. Start Delphi by double-clicking on its Launch icon. A new application starts by default. Save all files. Shift+Ctrl+S gives the Save Unit1 As dialogue followed by the Save Project1 As dialogue. Navigate to a suitable folder and save the unit as uHelloWorld, to which Delphi will be give the .pas extension. Save the project as HelloWorld to which Delphi 7 will give the .dpr extension. Open the View forms dialogue (Shift+F12) then select Form1 and click on the OK button. Reduce the size of the form by dragging its bottom right corner towards the top left corner. Leave room for a label. Click on the A button then on the form to add a label component to the form. The label icon is shown here with its tooltip. (Make sure that the Standard tab of components is selected). 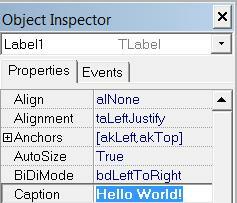 View the Object Inspector (F11) and type Hello World! as the caption of the label. Press the F9 key to run the program. The files will be saved automatically, so you do not need to save them first. After a small delay, you should see a form appear. Click on the cross at the top right of the form to make the program terminate. Press Ctrl+F12 again and view HelloWorld.dpr. If you can think of anything we could have made more straightforward for you, then please let us know. If it did not work, then please tell us what went wrong. Alternatively, you can move on to the next topic in this guide. The next program, GreetUser has a little more functionality.